I am happy today to publish a Guest – Post by my friend, Rob Tims, who serves as Discipleship Strategist, Lifeway Church Resources Division, and is also the author of a new book I have just read and highly recommend, especially to anyone who grew up in the South. 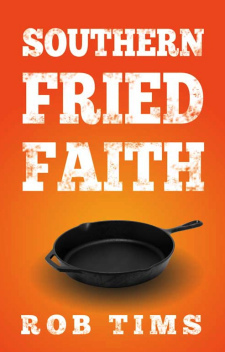 Rob Tims is the author of Southern Fried Faith. Learn more about Rob and his ministry at southernfriedfaith.com. With only two words, how would you describe your personal attitude or state of mind when you arrive to worship on Sunday? I could use most of the alphabet, but you get the point. For far too many Sundays, I walk into corporate worship hassled and hurried as a result of any number of excuses, most of which have my own sin at the center. Sure: my wife and three kids are just as guilty as I am for our inability to be in worship on time and in a proper frame of mind, but their sin is no excuse for my own. … I essentially accept corporate worship will be disappointing most of the time. My frustration at both these circumstances and my resignation to them reveals that I know such words should not describe my attitude in worship. Surely there are better words that should describe our state of mind as we enter into worship. There are, but they might not be what you think. We might be tempted to think they are the opposite of words I’ve already thrown out. Instead of “anxious,” you might choose “calm.” Or instead of “frazzled,” you might say “focused.” Certainly, “calm” and “focused” can be great frames of mind in worship, but are these the kinds of feelings God wants me to have when I enter in? Maybe, but there are definitely two that all too rarely describe my attitude toward worship, yet are all too essential for it to be a genuine experience that honors the Lord. There are two things that I love about these words. First, no style of worship has the patent on worshipping with “reverence and awe.” God’s holiness is bigger than our battles over electric guitars, printed music, or choir robes. Different church cultures can experience worship with reverence and awe in a myriad of ways, and any church culture can become a slave to its methods in a way that distracts from God’s holiness. That God is a consuming fire requires that I worship with reverence and awe. What’s amazing about this is that reminding myself of this reality as I walk into church on Sunday morning has a way of helping me work through those distractions that constantly pull at me prior to and in worship. My squirmy kid, that person’s mobile phone, the sound guy’s forgetfulness, and that preacher’s long sermon simply don’t matter nearly as much when my attitude is “reverence and awe.” A growing understanding of who God is far outweighs any of those things that might distract me from Him. And in so doing, I can honor Him in my worship. In his book, Praying Twice, author, hymn writer, and professor Brian Wren contends that congregatonal song needs to hold to the following indicatives. It is corporate. Wren says that singing together brings us together. In singing together we belong to one another. The goal of the activity is not musical, but spiritual. Perhaps best of all, he says that a congregation’s corporate song makes a bold theological statement: “We are the body of Christ.” Ignatius of Antioch says that we sing in one voice through Christ to the Father, so that He might hear and recognize you through your good deeds as members of His son.” His statement is reflective of truly Trinitarian worship that in its corporate nature reflects and comprehends the interaction of God in Three Persons. It is corporeal. Music stimulates heightened alertness, awareness, and excitement. Wren notes the obvious, that singing is a physical, bodily activity. While many of Puritanical worship traditions struggle to strike a balance of physical movements that seem rightly expressive, yet appropriately humble and not distractive to others, Wren notes the Bible’s affirmation that human flesh, and the human body, are part of the material universe that God created, and Himself affirmed as ‘very good.” (Genesis 1:31) Wren further posits that God did not make us as brains walking on stilts, but as embodied beings. When we sing from the heart, with full voice, some of us use our bodies more thoroughly, perhaps than at any other time during worship. Sometimes attitude follows practice, such that body and spirit and inseparable, and when we sing with full voice our attitude changes. Wren contends that when body attitude combines with deepest beliefs, singers are taken out of themselves into a heightened awareness of God, beauty, faith, and one another. This seems to me to describe a clearly desired end in our corporate worship. It is inclusive. Almost everyone can sing. This is not to say that everyone’s singing is equally tuneful, or that there is no distinguishing of quality of voice or musicianship. Once again, however, this is not the objective of this singing. Rather inclusivity is expressive of the spiritual act in which we engage in this worship action. Inclusivity in song is a theological value, a corollary of unity. Wren says, “a congregation cannot demonstrate its unity in Christ if people are shut out from its song.” (Note: this seems more reason why division into age-based, or worse yet preference-based groupings misses the point and theological potency of corporate worship) Admonition to make a joyful noise is not just a slogan, it should be a compelling invitation to be part of the worshiping body. It is creedal. This is a wider meaning that just singing the historic creeds. Rather singing in this way helps us express a believing response in a self-committing way. The words of familiar songs help shape a congregation’s theology, and music summons them in time of need. Some practitioners push back on words like “familiar,” but most often I find such reaction to stem from another agenda, which we will not go into here. When a particular text is sung regularly matched to a particular tune it gains power over our memories. It is ecclesial. Corporate worship singing offers opportunity for mutuality in ministry by co-ministry through the shared expression of belief, ministry, and mission. Such expression of priesthood of believers is part and parcel of the church being the church. In the act of singing, the members not only support one another, but proclaim a community of faith reaching beyond the congregation that sings, and identify with the universal worshiping Church. Congregational song is ecclesial when we know that the community sings for us, even when we cannot join in, and that the song joins us with other singers, local and distant, past and present. Martyred Lutheran pastor, Dietrich Bonhoeffer was said to have been upheld by hymns not only because of their value in personal devotion, but because of their power to connect him to the worshiping Church. It is inspirational. Unified congregational singing is inspirational, lifting us out of the mundane and the ordinary. Wren believes that such singing puts the words of song in motion, so that they are no longer static sets of words on a page but shapes of sound that exist in time, beginning at one moment, traveling towards a point, and then drawing to a close and stopping at another moment. He comments on how songs can inspire an individual singer, but we would note as well that singing may also engage a local congregation, or even larger body toward Christian action or missional engagement. It is evangelical. 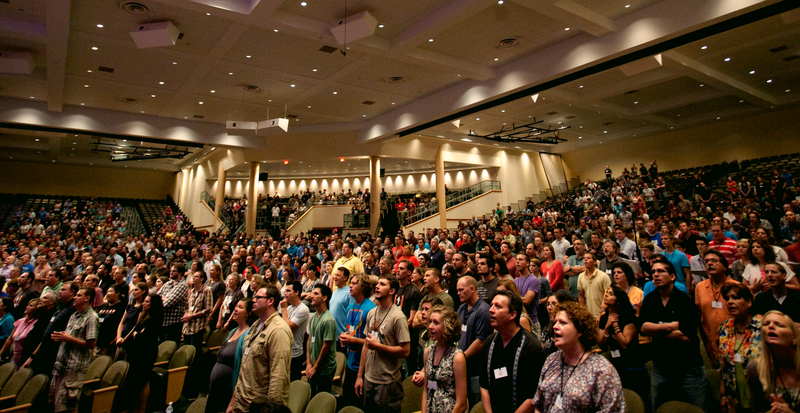 In healthy church environments, singing the truth of the Gospel, reignites evangelical flames among members of the congregation. For unbelievers present among those in a worshiping singing congregation the words and song may well function as Don Hustad states, “to reach out with arms of melody” to those outside the faith. This reaching may occur within the public worship context itself, or may extend through the changed attitudes of believers who depart the corporate worship experience to move with heightened sensitivity to ways they can live out the Gospel in their neighborhoods and communities. Brian Wren Praying Twice: The Music and Words of Congregational Song (Westminster John Knox Press: 2000) 84 – 97. OK, folks, if you watch or read the news on the world stage at all, you know that things all over the planet are in a mess! I’m not talking about our US economy that still hasn’t recovered, or our healthcare fiasco. Those things are certainly problematic, but seem nearly insignificant by comparison to the explosive situations that characterize the conditions throughout the Middle East, and/or the convicting scenario that continues to develop on the U.S. Southern boarder where thousands of children are coming to the U.S. These are surely complex situations that have no easy solutions, and seem to perplex world leaders. Please note, that I do not care one whit (whatever that is) about getting into discussion of political solutions, ramifications of military involvements, or any other political science type issue. Pundits on TV and social media can handle that all they want. That is not what this blog is about, and seems there is already just too much talk that is just talk anyway. One can easily just feel overwhelmed with the weight of the current conditions in the world. We may feel that weight until, that is, we come to worship. So, the question is, what is worship suppose to be like in the face of all this turmoil in the world? There is some bad stuff happening out there. Of particular note are the shocking conditions that our Christian brothers and sisters are facing in other parts of the world. 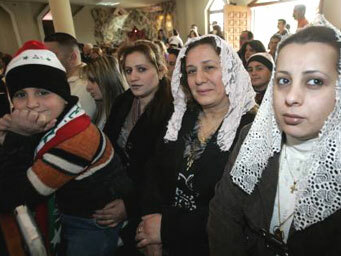 Being starved to death for standing true to their faith in Christ? Crucified at the hands of terrorists in the name of religion? Where is God in all of this? What’s a Sunday worshiper to do? What is a worship leader to do? This is a bummer! And no one wants to think about depressing stuff in worship. Then again, perhaps the conditions of the world are something God will use to confront us with the timbre of our usual worship environments. Just maybe God is challenging us to wake up from our lethargic worship practices with their controlled, self-obsessed characteristics, to call us into a worship that enacts the gospel, opposes evil for what it is, and engages in the real struggle that “is not against flesh and blood, but against the rulers, against the authorities, against the powers of this dark world, and against the spiritual forces of evil in the heavenly realm.” (Ephesians 6:12) Maybe that is the real war that worship is to wage. Presbyterian Pastor Mark Labberton confronts us with the impotence of our discussions about worship, which end up really just being indirect ways of talking about us, and not about God. Discussions of real worship that humbles before the Living God, and bows our will to the Lord of all, will likely have us denying ourselves daily, taking up our cross and following him. (Luke 9:23-24) Labberton says the crises of our current church culture is that “our individual and corporate worship do not produce the fruit of justice and righteousness that God seeks.” The author/pastor delineates what he calls False Worship Dangers, which he cries out for us to fasscscchallenge because of the temptation to give in to them as if they were for real. I believe these to be spot on, and thus want to simply list them as they are given, and encourage you to explore further on your own should you care (or dare) to investigate. Only one community has no history of lying ; the Trinity – Father, Son, and Holy Spirit. This is why our worship must be Trinitarian, caught up in this interaction of perfect union, perfect love. We are given to lose our love for neighbor, forget the widow and orphan or oppressed, and yet still try to tell God that we love Him. When we do, worship becomes a lie. Whether the twisted inferences of so-called prosperity gospel, or the over-romanticized expressions that infer a Jesus who is like our boyfriend or girlfriend, or an implication of either cheap grace or no grace at all, God is never conformed to be the god we want him to be. Indication to the contrary surely have dire consequences for the church and for our watching, groaning world. Genuine worship does battle with the evil in the world by lifting high the Christ, the ultimate Victor. Hardly a bunch of feel-good songs with oblivious pronouns, or motivational sermons driving powerless people to work harder in their powerlessness. Instead, Onward Christian Soldiers! Mark Labberton, The Dangerous Act of Worship: Living God’s Call to Justice (IVP Books, 2007) 22. WHATEVER HAPPENED TO JOYFUL JOYFUL? I could add these titles to others I have read that sound a similar tone, Unchristian, You Lost Me, The End of Religion, and I Sold My Soul on Ebay to name a few. Just re-reading these titles makes me wonder if I should just give in, save some time and read Atheism for Dummies, and be done with it. Looks like some marketeers have discovered power a la shock jocks. But wait! Most of these books (not the Atheism one, of course), have subtitles that give a bit more optimistic outlook, and actually reflect more of the intention of each book and its author. We all know that it’s the “answers” people are looking for, even though it seems to take the Debbie Downer titles to get our attention in the first place. The “Change or Die” (another title actually) tactics do tend to capture our attention in our alarmist cultural context. So we feel a little better if we read 12 Ways to Keep Your Church Alive, How 4 Acts of Love will Make Your Church Irresistible, or How 4 Acts of Love Will Make Your Faith Magnetic. Ah! Now we’re getting somewhere, because these subtitles give us some hope. To be fair, most all of these authors are attempting to offer helps to church leadership. And everyone – even, or perhaps I should say, especially pastors and worship leaders – wants hope. You know what gives real hope? Worship appropriately centered in the Gospel of Jesus Christ! I am fearful that our obsession with ourselves and how we feel about worship has distracted us from true worship that Robert Webber calls “the gospel in motion,” the Christ Event. On the other hand, I am fearful that leaders stare at negative numbers in church attendance and financial giving, panic seeing as how their own livelihood depends on such things, and begin to use worship for other purposes. It is just such thinking that leads us to start focusing worship on how it will make us feel about ourselves as we try and use it to evangelize, or proselytize members of other churches to our setting. Under the pressure to produce numbers, pastors and worship leaders try and motivate the congregation to get to work! The unintended message becomes, “we can change lives. We just need to try harder and do more.” Quite unintentionally, as we emphasize the power of us, we de-emphasize or worse yet un-faith the power of God. Worship in the New Testament, like worship among the Hebrews, is rooted in an event: in the living, dying, and rising of Christ, the power of the Evil One has been dethroned and a new creation has begun. This new creation is the Church, the people of God, and we are called to live in Christ. That is, we are to be like him; we are to live according to his new commandment of love; and our entire life is to be an expression of Christ in us. Christ living his life through us. We are Christ’s hands, and his feet. He goes on to reiterate how our worship acts out the Christ event. As proclaimers of the Christ story, certainly it takes on a very personal flavor. “The worship that celebrates Christus Victor is a worship that takes hold in my life and calls me into the victory of Christ in my day-to-day living.” Just as the song of the Old Testament is the story of God’s deliverance of His people, so the song of the New Testament is the song of the atoning Lamb of God Who takes away the sins of the world! As the story and the song becomes ours we enter into the song of the redeemed, and this is a forever song. I hope that even in just reading the above paragraphs you can get a sense of the victorious tone of the Gospel. This is far superior to any happy clappy musical experience that depends upon musical gimmicks to make us think we are having a good time. It is also superior to lyrical self-obsession where the center point is really me. Such can surely not compare to our participation in Christ’s defeat of the devil, and of the power of evil. Webber reminds us “God wants to see the devil defeated in our life and Christ truly risen as the new creation in us.” This is display of Christ’s victory over evil at work even in our lives. Surely this victorious tone of gospel display will bring back the song that is Joyful! Joyful!